As always the ygopro program should update automatically. If it doesn't work for you then download the manual update from the download page. The ATK and DEF of Harpie Channeler are switched. And the artworks of Harpies are censored. How can I refresh the multiplayer list without clicking? I tried F5 and it doesn't work. Problem, some cards like Armor Kappa or that Beast God Vulcan thing still don't have their pictures. What do I do? Olvidé agradecer la actualización pasada: gracias man. It is possible to add a "Power of Chaos" mode? Also just playing with the 771 cards from "Joey The Passion". 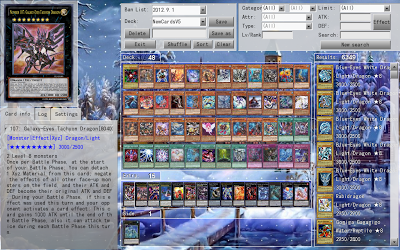 Percival, I found a problem in the card Malfunction, it is not working, ie not counting trap cards as it should. Or is I am doing it wrong? How can I fix the cards that are still blank? Like Armor Kappa and some of the new cards? i cant seem to use battle eagle tokens from number 42: galaxy starship tomahawk in a xyz, or synchro summon, is it broken or is there something im missing here? You can never xyz with tokens as they are not real monster cards as soon as they are no longer normal monsters they vanish. As for synchro you should be able to synch with those tokens nothing in the card text says other wise just keep an eye on what cards have been played the number of times I have played people who forget about duality is just silly. Besides The ATK and DEF of Harpie Channeler are switched. After Catastor attacks there is a pop-up saying "your opponent cannot activate any spell/traps this turn", the rest of the battle proceeds as normal. i cannot use unibirds effect with eagle tokens? hello percy I have a question about the magic card rank-up magic brian's force, when the use of number 39 and 105 works, but if I use it on a monster xyz to summon a monster chaos xyz does not work, I have all of the terms for 'evocation but does not work, why? you could help me I would be very grateful ..
Percy, what do you think of making Cardfight Vanguard programm like YGOPro? When I summon a Egyptian God, my opponent can active spell/trap, why ? , graverobber (anime version), Roll of Fate,Star Blaster,Landstar Forces,Silver Dollar, Grappler of Landstar,Brigadier of Landstar,Knight of Landstar,Summoning Clock, Rebellion,Berserker Soul,Necromancy,Underworld Circle,and Zombie Jewel. 1. Open file System.conf with notepad. Save file.... And be Happy. I can't edit or create new decks with this version. I press save and nothing happens. Ok I can't delete decks from within the game or save replays either, what the heck? The only thing that works is dueling, nothing else. King of the noble knights doesn't work. People, when vo watch on replay the game closes itself. How do to solve this? And finally, make sure that you can summon monsters chaos xyz with rank-up magic brian's force. If you can help or not please reply. Can somebody help? I can't edit or create new decks, I add or remove cards, press save, and than nothing happens. the link update v3 to v4 is wrong. theres only v4 to v5. Please fix it! where can i download?. Thanks. I dont know if its just me but "Sacred Phoenix of Nephthys" wont activate its effect after being destroyed from hand by "Fire king beast yaksha"
I have a problem. I opened the launcher and it said there was a new update available(linux beta), so I installed it. However, after it finished installing, I was unable to open the launcher, and it said I was missing a MSVCP100D.dll. Even after installing the dll I am still unable to open the launcher. I tried that before and worked just fine. It comes back during *your* next standby phase. If you are sure it is not working, can you upload a replay of that bug somewhere? Please, just start uploading on mediafire or something next time. Hotfile is HELLA slow. Hey Hey Hey. Can ou make something with Number 7 Lacky stright? Why it's eff that increase atk go off after just 1 turn? effect veiler still negate the effect of genex neutron. Target 1 monster on the field; BANISH THAT TARGET FACE UP. Add the other cards of Lord of Tachyon galaxy, pls!!!! Isn't it possible to be able to turn off the turn timer when you host. Even when just playing with friends it's really annoying to suddenly hit the timer. Hi guys.. i have a problem with this.. when i open YGOPRO to type a words to find card.. it did not appears a letter.. i done change the font too.. but still didnt work.. I lost a game because Thunder King Rai-Oh's effect didn't work. can you fix this? I found a bug on Contract with the Abyss. I tried to summon Demise, King of Armageddon by tributing Ancient Gear Gadjiltron Dragon in my hand, both level 8 monsters so it should have worked, but it didn't. There were no cards on the field that prevented Contract from working. I know this works because I've done it in another Yugioh game. Thunder King Rai-Oh's effect is correct. percy hello there will be the v6? Can you make it so I can chain to card effects/actions with the mouse instead of just the keyboard only? Umm when I try to open 1.02F.0 Percy v5 for multiplayer it shows failed to open url. Hey percy I have a late 2012 mac mini and I want to get the latest version of ygopro on it. How can I do it?